Held every Wednesday, on the Prospect Estate in Farnborough, and open to all the estate residents. Computers are available for local residents to use, complete with free internet access. 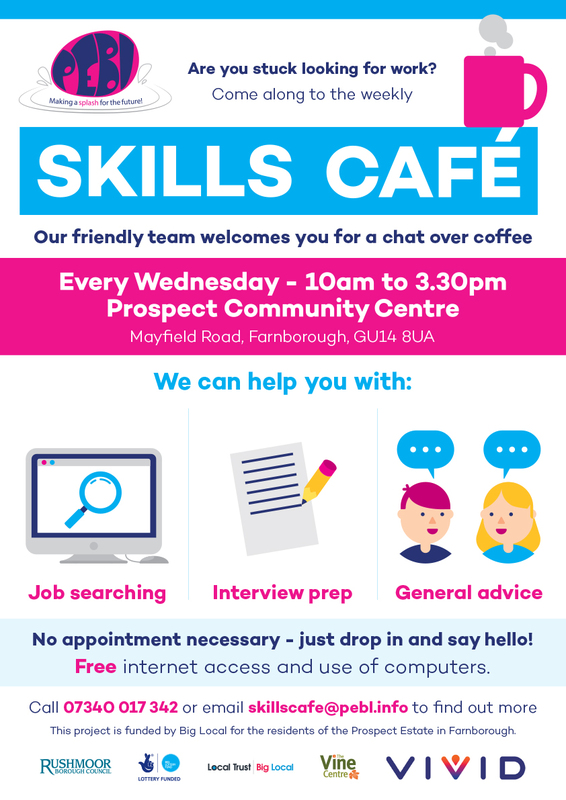 The friendly team is on hand to help with a wide range of job searching services including: writing CV’s, improving computer skills, applying for jobs online and practicing interview skills. We signpost people to a wide range of local training opportunities, including those held at The Vine Centre. As well as this, we hold regular recruitment events and run workshops on a variety of subjects such as; preparing for an interview. We offer career advice to people who are looking for a change of scene or returning to work after a break. A Citizens Advice representative visits every week to give advice about benefits, budgeting, paying bills and anything else money related. The VIVID Homes, Employment & Training Adviser provides extra help to VIVID tenants each week. The local adviser from National Careers Service also regularly attends to give visitors one-to-one help. There is no need to make an appointment for Skills Café, just turn up. KD has really made the most of the PEBL Skills Café. We encouraged her to become a PEBL volunteer when she first started at the Skills Café and she now helps run the PEBL Knit and Natter group and the PEBL After-School Reading Group. She has completed the New Year, New You Course as well as IT courses at the Vine Centre. She has updated other skills by undertaking safeguarding and food hygiene courses and is now applying for Learning Support Assistant vacancies. EH joined the PEBL Skills Café to improve her skills and find a new job. She completed the Vine Dining Catering course at the Vine Centre gaining a Certificate in Food Hygiene as well as learning other skills such as customer service and first aid. She has now found work at a local care home but still pops in to the Skills Café to say hello when she can.